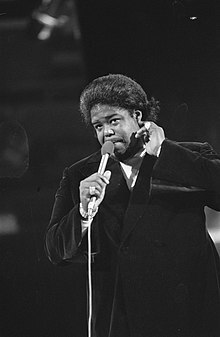 Barry Eugene White (born September 12, 1944 – died July 4, 2003) was an American soul singer and songwriter. White was known for his rich bass voice. He won two Grammy Awards. White was African American. He was born in Galveston, Texas and grew up in Los Angeles, California. He died on July 4, 2003 of kidney failure and was cremated, his ashes were scattered by the California coast. This page was last changed on 2 November 2018, at 18:29.